Vive la France—vive la liberté! The proud country of France blends its historic European sites with its changing landscapes full of natural bounties. 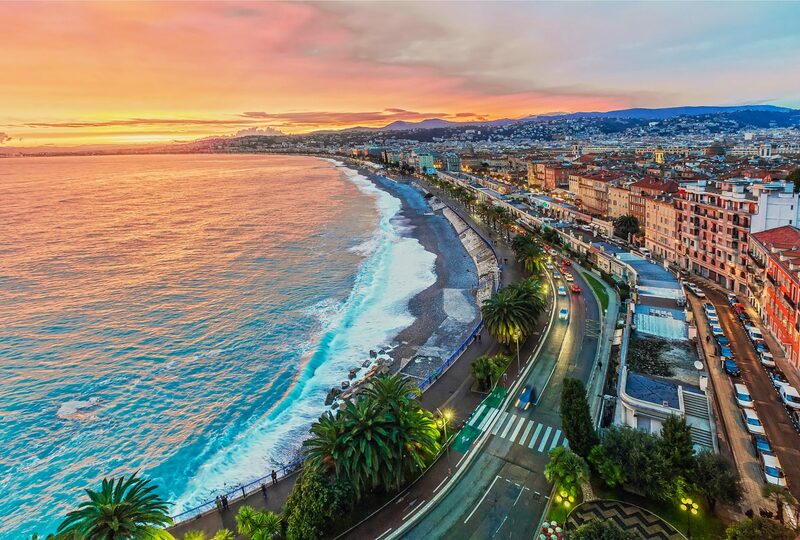 Mountain ranges run along the scenic French Riviera, the towering coastal cliffs of Côte d’Albâtre shadow the shores of Pays de Caux to Seine-Maritime, and sandy plains cover Languedoc. Rivers rush through the country, giving lifeblood to its abundant nature and wildlife that inhabit its shifting geography. The rivers that pulse through the country give way to valleys. They feed France’s vineyards and formal gardens, spilling into lakes and aqueducts like Pont du Gard. France’s beautiful lands are manicured to perfection in places like Champ de Mars, a landscaped park where birds gather in trees that line the green-space between the Eiffel Tower and the École Militaire. Naturally, you’ll be drawn to witness the Eiffel Tower, a symbol iconic to France. Its wrought-iron latticework is internationally recognized. The Louvre Museum will pull you in, the former historic palace with its massive art collection, featuring Roman sculptures to the famous “Mona Lisa”. The Palace of Versailles drips in opulence, the gilded 18th-century palace where French royalty once wielded immeasurable power. Arc de Triomphe stands in dignity as tribute to Napoleon’s victories, a true homage to one of the greatest French war leaders. You’ll be taking the famed route of Champs-Élysées to all of these destinations, with plenty of French cuisine and boutiques along the way. Explore the diversity that lives in the forests of Rambouillet in Yvelines, or in the Calanques National Park in Bouches-du-Rhône, where cobalt waters are home to marine life, stretching between the wild and rugged terrain of the Massif des Calanques. The French Alps are a majesty all of their own, where Mont Blanc sits as king of the throne at 15,774 feet. Skiing, snowboarding and snowshoeing the snow-covered peaks offer a way of life all of its own accords. The Alps are wild, extreme in their temperatures, their heavy blanketing of snow, and their mountainous height, but adventurers and amateur explorers can traverse them via tramway, cable cars, trails, and ski lifts. Vanoise National Park and Écrins National Park make accessing the Alps and its generous exhibition of nature simple. Spot an Alpine ibex, stoically standing on rocky terrain with its iconic horns curving along the length of its stout form. Wander through the medieval city of Yvoire, with statuesque, stone chalets embodying the best of French architecture. See the Palais de I’Isle in Annecy, a town centered on the stunning aquamarine lake. Charter along the French Rivera, where coastal cities welcome travelers with peaked stony cliffs, as bright blue waters lap against the shadowed shores. Fashionable shopping, high-end boutiques and chic storefronts line historic street. Tantalizing aromas of authentic French cuisine spill into the air in cities like Nice, Cannes, and Antibes. Yachting here offers an ease of passage to these immensely popular cities. Stunning achievements in architecture hold true in places like Sacré Cœur, the domed white church known as the Basilica of the Sacred Heart of Paris. It towers in its impressive standing over the base of the butte Montmartre, the virgin white of its stones a start contrast against a backdrop of bright blue skies and the sprawling green carpet of lawn. But French masterpieces do not end here—at Musée d’Orsay, 19th and 20th-century European art collections are housed in this former railway station, where modernity meets traditionalism. Moulin Rouge, the famed 19th-century cabaret with Belle Epoque styling will tempt you inside its doors with dinner, dancers, and magnificent costumes for an unforgettable evening. In contrast, the landscaped, regal grounds of Tuileries Gardens cordially invites visitors to mingle on this public place, the very same space where Parisians gather to celebrate, relax, and enjoy the lust of life in their tremendous city. See the revolution of Avant-garde up close in the Centre Pompidou, a multicultural complex where the National Museum of Modern Art, library, and music center resides. You can go deeper with a visit to Les Invalides, where navigating through a series of army museums will enlighten you to France’s proud roots of a military past, including the tombs of famed officers—with the most famous of them all: Napoleon. But to really make your skin crawl, there’s the Catacombs of Paris, an eerily illuminated labyrinth where the remains of over six million people rest. For a more uplifting avenue, venture to Latin Quarter, where students flock to quaint cafés, bustling in and out of charming bookshops. There’s the natural wonderment of Verdon Gorge, an aquamarine river pulsing through high cliffs, the calmer waters of Canal du Midi, where one can enjoy cycling and boating along its long stretch, or Île de la Cité, an urban island where the famous Notre Dame cathedral resides. France is not without its castles and palaces. Palais des Papes once rivaled the Vatican. And the 14th-century palace still stands in the glory of its frescoes and twenty-five spacious rooms. Châtea de Chenonceau embodies French opulence and gorgeous architecture as the 16th-century property stands proudly on its groomed grounds. Equally striking is the Renaissance palace of Château de Chambord with its multiple formidable towers and cupolas guarded by a moat. Chartering through such a diverse country will not disappoint. Wine flows through the cities as rivers flow through its lush valleys. The smell of baked bread rises to fill the streets, accompanied by rich coffee, jam-filled pastries, and fine dining to cap off any evening.